Tom Taylor, a comics writer and creator of Netflix’s The Deep, is currently live-tweeting a waking nightmare. Having sequestered himself in a log cabin somewhere in rural Australia to concentrate on “some intensive writing,” Taylor has found himself terrified by a series of strange events he’s decided to share with the world. 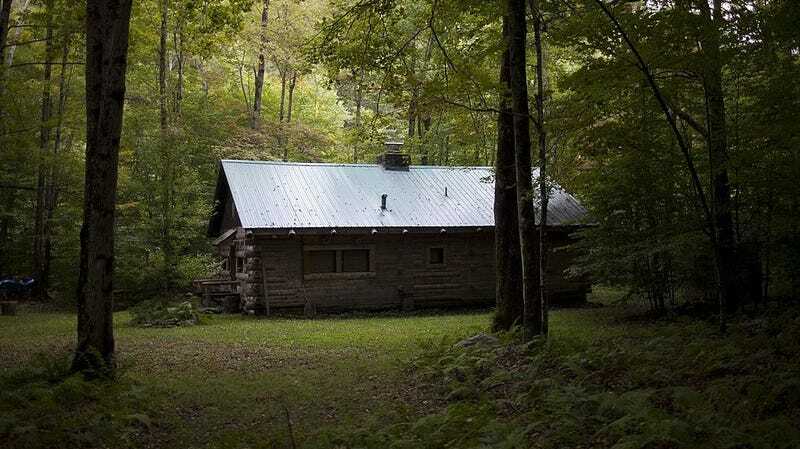 Yesterday, after a particularly eventful Sunday night, Taylor began tweeting details of how things have been going while alone in the woods, a mind full of cabin-based horror helping blur the line between real and imagined scares. It starts with an easily dismissed bit of wind chime spookiness. Soon enough, imagination already ignited by rusty hooks and self-ringing chimes, Taylor starts hearing noises from the bushes (a running theme in the story is trying to tell the difference between whether something demonic is afoot or if he’s just, y’know, in Australia). Things take a bit of a turn here, becoming more forcefully ominous. Once again, he tries to rationalize the weirdness by hoping the stranger was an early-morning jogger. Mind already blurred with panic, even more bizarre stuff starts happening that can’t be related to a jogger...unless, well, the jogger is a cabin ghost out for some exercise before the harsh rays of cleansing sunlight temporarily drive it back into the grave. Before long, after speaking to his wife, Taylor lies down in his poltergeist-ridden bedroom and records some tapping sounds coming from the ceiling. Shades of Evil Dead not being enough for the cabin, it appears to be gearing up for the acorn-raining terror of Antichrist. Taylor, once again, tries to tell himself it’s just an animal. As if the universe is playing a particularly nasty trick on him, he wakes to someone pounding on the front door and, refusing to open up to sign a delivery slip, receives a mysterious package. As the thread has caught on, people have spotted stuff even Taylor’s fevered mind has missed. There’s what looks to be a stuffed bear in a fireplace from one photo and someone standing in the cabin’s window when he was locked out in another. He’s also found a reception-less old TV, seemingly put in the cabin just to enhance the ambience, and, last but far from least, recorded another big, freaky roof thump for good measure. All of this unverifiable spookiness could, of course, be manufactured by Taylor as viral self-publicity. But, that being the case, it certainly doesn’t take away from the fun of being told a scary story through social media in bite-sized installments. The good news for anyone interested in following along is that Taylor apparently has four more days of haunted cabin living to endure. Check back in later when, we can assume, he’ll be locked in battle with a flesh-bound ancient book, fighting off gibbering corpses with his chainsaw hand. Larry Fessenden on Frankenstein, art, and Universal&apos;s Dark Universe: "They don&apos;t understand horror"